“I see an opportunity to bring STEM / STEAM to a large number of students in the area and to make a difference in how they learn and adopt to the ever-evolving technologies”, says Anshu Gupta, STEM For Kids franchisee in Upper East Manhattan, New York. Anshu is an active parent in the PTA community and through her extensive discussions with teachers, she discovered that schools, including her own children’s school, could benefit from an external STEM based curriculum to keep up with the growing body of work. Used to challenging herself with new ideas and executing to the fullest possibility, she set out to “make learning fun” and enable the mainstream adoption of STEM disciplines across the schools in Manhattan. “I feel learning should never stop and the love for learning starts at childhood”, she says. 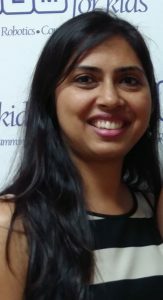 Anshu had previously left the corporate world to enjoy motherhood and now helps her community stay engaged and connected through her endeavor, Sparkles Events. The activity-based inter-disciplinary learning of STEM brought her to STEM For Kids and she is excited about the immense potential for STEM programs to creatively engage young minds. “Being a mom, like every parent, I want the best for my kids”, Anshu says. Lear more about the programs being offered at NY Upper East Manhattan or request programs at your site by visiting stemforkids.net/t/nyuppereast or email nyuppereast@stemforkids.net.